A terminal cancer diagnosis has spurred a father of two to spend the rest of his days improving the lives of others. 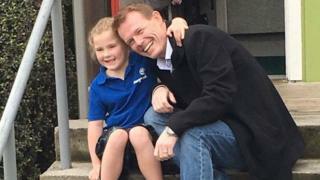 Kevin Carr, a former logistics manager of the New Zealand All Blacks, set up the Chalky Carr Foundation after being diagnosed with pancreatic cancer. While undergoing chemotherapy, was told the fact it has spread means he is unlikely to be clear of the illness. But instead of giving in, he has vowed to dedicate the rest of his life to helping other affected by cancer. The first is seven-year-old Isla Lunn, who recently lost her mother to breast cancer. Mr Carr is raising 100,000 New Zealand dollars (£55,000) for her. Just two weeks into the appeal he is half way to his target. The 45-year-old was born in Sutton Coldfield, West Midlands, and grew up in nearby Aldridge, but emigrated to New Zealand 19 years ago to live with his wife. A lifelong rugby fan and player, the former Royal Marine got a job with the All Blacks and was on tour with the team in June 2016 when he fell ill.
"I went yellow with jaundice and had various blood tests and was very quickly diagnosed with pancreatic cancer," he said. He underwent surgery and a round of chemotherapy, but found it had spread shortly before the All Blacks Test series with the British and Irish Lions in July. Why is cancer a taboo in black and Asian communities? "It was a huge blow. It's the fourth deadliest cancer in the world, so we always knew there was a risk it was going to come back, but prayed and hoped that it wouldn't. "Because of the recurrence, it had that terminal label attached to it, but to me, that's just a label. You don't know what's around the corner." Mr Carr resigned from his job in rugby so he could concentrate on treatment. But he was inspired to set up the Chalky Carr Foundation, so-called after his nickname, when his sons decided to have their heads shaved for charity. Mr Carr joined in, with All Black lock Sam Whitelock manning the clippers. He was moved to raise money for Isla after hearing her 38-year-old mother Kellie had lost her battle with breast cancer. The cash will go towards a "nest egg" helping her to live life to the full, he said. Mr Carr has vowed not to let the disease control him. "One thing that kept me going was there was always someone worse off than me." After helping Isla, he will find others to support as well as fund research into pancreatic cancer in New Zealand. "We are going to look to continue to raise money over and above the 100,000 dollars for Isla, for people who are impacted by cancer," he said.